after 2 days of modeling, here is my latest creation. EDIT: edited laser wings and glowing effects. added different camera angles. i'd define them drone guns. don't forget that the game was for ps2. i've made another render in a more dynamic pose. i'll submit it soon. ...I'll try not to flame, but if your gonna use someone elses work as a base please give credit and ask. 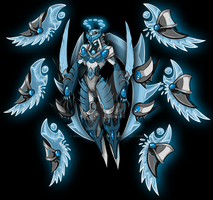 Its obviously using my scrapped valkyrie design as its base. I'm not gonna report you cause you did indeed do a good job on the modeling, but please give credit and ask next time mate. yeah, i found your work on google images, so i didn't know the name of the author and that it was made by a DA user. you propably saw it on blenderartists then XD. Hey that's pretty cool there and the name fits it. Hmmm... Nekomata. Nice name for an Orbital Frame! And I suppose it is supposed to be a cat like Orbital Frame? well, something like that. a demon cat. 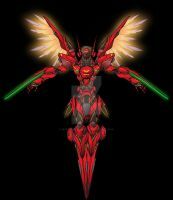 I have play the 2 zone of the enders games.. The second one was awesome! however it's not an action game, but a tactical.